It's the end of an era: Outrun Online Arcade is in the process of disappearing from online services thanks to the Sega's licensing deal with Ferrari expiring. Sega's Outrun was one of the defining games for the arcade generation that grew up in the 1980s and early 90s. However, thanks to the fact that the licensing agreement between Sega and Ferrari has expired, Outrun Online Arcade has now been pulled from the PlayStation Network and will be removed from Xbox Live Arcade in December 2011. The PSN version's removal is apparently tied to the fact that System 3 released Ferrari: The Race Experience on the European PSN last week. According to Gamasutra, "those that have already downloaded the game will still be able to play it, though it's unclear whether existing owners will be able to re-download their purchase after the removal." 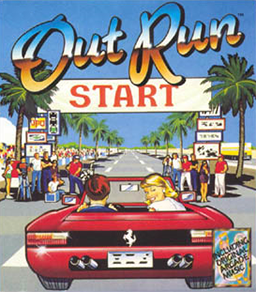 The Outrun series has been closely tied to the Ferrari brand ever since the first game arrived in arcades back in 1986. Back then, the game featured a red car that looked an awful lot like the Ferrari Testarossa convertible; it wasn't until the 2003 release of Outrun 2 that Sega officially licensed Ferrari automobiles for the series. Meanwhile, Outrun Online Arcade featured ten different Ferrari automobiles when it hit PSN and XBLA last April.